- KYC related changes for the bank accounts and levying charges. Join us to understand why banks are charging depositors and how you as consumers can participate in this campaign against bank charges. 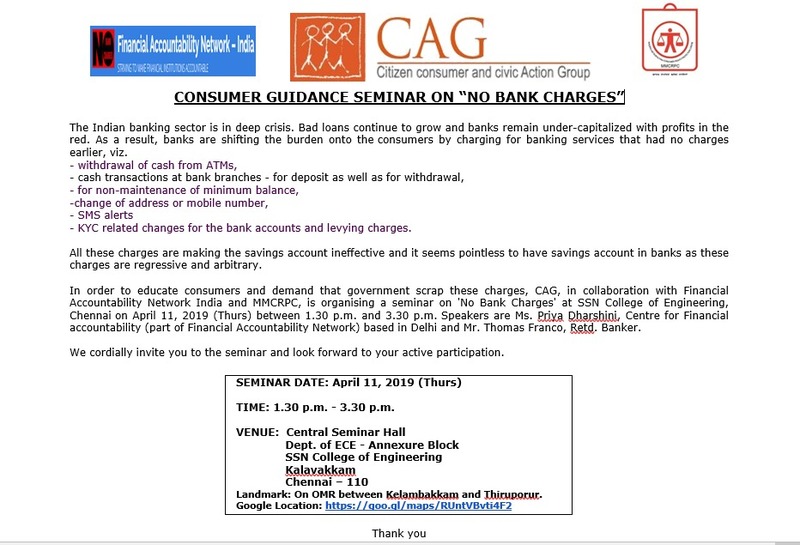 CAG, in collaboration with Financial Accountability Network India and Madras Metropolitan Consumer Rights Protection Centre, is organising a seminar on No Bank Charges at SSN College of Engineering, Chennai on Thursday, 11 April 2019. Speakers are Ms. Priya Dharshini, Centre for Financial accountability (part of Financial Accountability Network) based in Delhi and Mr. Thomas Franco, Retd. Banker.